It feels like an age since Ergen’s plan for fixed wireless broadband and hosted small cell deployment on rooftop satellite TV antennas was at the core of his bids for Sprint and Clearwire in 2013. And as I pointed out last year, the AT&T acquisition of DirecTV seemed to pre-empt DISH’s plan and threaten more competition if DISH did proceed with a rollout. Now the prospects of DISH reaching agreement with T-Mobile seem as distant as ever, and Verizon and AT&T appears eager to dismiss any prospect of them buying DISH’s spectrum. In addition, DISH’s stock has fallen after the FCC ruled against it last week over the Designated Entity discounts in the AWS-3 auction and Ergen has hinted that as a result he might now seek to dispose of his spectrum rather than entering the wireless market. However, in recent weeks, Sprint has been playing up its small cell plan, but has not yet named its partners, except to hint that it will look towards off-balance sheet financing for the buildout. So I wonder if Charlie’s next angle to put his spectrum to use could be through a partnership with Sprint to make use of DISH’s rooftop sites in the small cell buildout, and perhaps host some of DISH’s spectrum at the same time. After all, the time when Ergen claims he is definitely leaning one way is usually the point at which he moves decisively in the opposite direction. Such a deal could include an exchange of equity, with Softbank investing in DISH and DISH investing in Sprint. That would be a logical explanation for Softbank’s otherwise incomprehensible recent moves to buy additional Sprint equity in the public markets, rather than injecting much needed incremental cash into Sprint. DISH could even participate in the network equipment leasing company (perhaps reframed as a JV) if it can use the cellsites for its own fixed wireless broadband (and perhaps mobile broadband) offerings. And none of this would prevent DISH from entering into a spinoff of its spectrum holdings, perhaps even with Sprint agreeing to act as an anchor tenant, leasing spectrum such as the PCS H-block and the adjacent AWS-4 uplink, which could be repurposed as a supplementary downlink and might provide Sprint with an alternative to bidding in the incentive auction next year. A spectrum spinoff (or other transaction) by DISH still seems a likely outcome, and the FCC appears to have helped DISH on its way, by stating it will accept an “an irrevocable, standby letter of credit” instead of immediate payment, which will only be drawn if DISH has failed to make the $3.3B repayment of the DE discount by 120 days after the release of the Order (i.e. mid December), instead of the 30 days available to make a cash payment. That concession (which doesn’t have any obvious precedents that I’m aware of) will save DISH 90 days interest (over $40M at a 5% interest rate) and gives Ergen much more time to sort out a deal to reorganize his spectrum interests. It feels like DISH will now finally have to pull the trigger on something, though I’m surprised no analysts appear to have even contemplated the scenario I’ve described above. The current uncertainty in the financial markets may not be helpful to the prospects of a deal being reached, especially if it proves difficult to get financing for a spectrum spinoff. Nevertheless, that need not prevent a small cell hosting deal, and with Charlie you simply have to expect him to have an angle most people haven’t thought of. Some have suggested that DISH is distorting prices by bidding against themselves (DISH has three bidding entities that can’t communicate with each other during the auction). While possible, this is highly, highly unlikely. Its useful to examine exactly why DISH was so successful in driving up the price of the AWS-3 paired spectrum to a price far beyond anyone’s expectations. One of the key objectives for a bidder in the early rounds of an auction is to discover the amount of spectrum that its rivals are looking to acquire (only later does it become possible to discover how much they are prepared to pay for that spectrum). The price usually rises fastest in the key cities and then as the mix of demand becomes clear, bidders can switch over to second tier licenses knowing roughly how much spectrum they will end up being able to win. We know that AT&T was looking to buy a paired 10MHz block, and it seems likely that Verizon would have been seeking roughly the same. Meanwhile T-Mobile wanted to selectively pick up one or two paired 5MHz blocks. If DISH hadn’t been bidding then everyone could have got what they wanted at close to the reserve price. However, adding DISH to the mix meant that the four key players were trying to buy more than the 2x25MHz of paired spectrum that was available. More importantly, DISH was bidding through three separate entities and instructed them to bid on all the licenses simultaneously in key cities, to ensure that AT&T, Verizon and T-Mobile simply didn’t know how much spectrum each other and DISH were looking to buy. 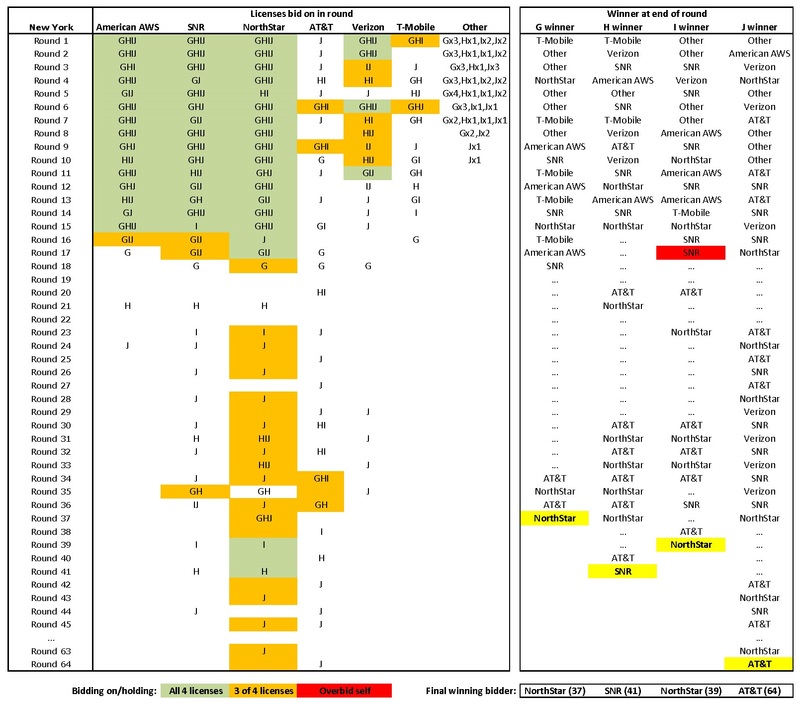 The chart below shows the bidding patterns for the G, H, I and J blocks in New York (the G block is a smaller 2x5MHz CMA license, while the H and I blocks are 2x5MHz BEA licenses and the J block is a 2x10MHz BEA license). We can see that all three DISH entities bid on every one of the New York paired license blocks they weren’t already holding all the way through Round 15, by which time the total combined gross price had reached $2.81B ($2.28/MHzPOP). In fact, it wasn’t until Round 18 (when the price reached $3.81B or $3.12/MHzPOP) that DISH’s bidding on these licenses began to slow (and SNR even overbid its own winning bid in Round 17). DISH clearly wrote the instructions to its DEs very well, because in the end there were very few cases where the final winning bid from SNR was topping an existing bid from NorthStar or vice versa (the largest license I’ve seen where this happened is the B1 unpaired license in Tampa BEA034 which sold for $21.4M before the DE discount). And it does seem that DISH complied with the letter of the rules: even though the FCC still needs to rule on whether the DE discount should be granted, it seems unlikely the FCC would want the auction to descend into chaos (which could theoretically result in a re-run). However, its clear that the rules for future auctions will need to be rewritten significantly – I would expect severe restrictions on DE discounts and common ownership of different bidding entities at the very least. Indeed, it will now be very difficult to come up with a workable structure to advantage smaller operators like Sprint and T-Mobile in the incentive auction next year. Where does the outcome leave us? Ergen did not buy a readily deployable collection of spectrum, instead seeking a blocking position in key cities (including New York and Chicago) in an attempt to force other operators to make a deal with him. Interestingly, most of DISH’s paired AWS-3 spectrum is in the G block, which is adjacent to and perhaps more quickly usable with the AWS-1 spectrum band, rather than being aggregated directly with the adjacent AWS-4 downlinks in the longer term like the J block. DISH also acquired most of the unpaired uplink blocks, which appears to be a hedge against the potential (and now perhaps likely) loss of LightSquared. However, with AT&T winning enough AWS-3 to meet its spectrum needs (and make it highly indebted) for the next few years (not to mention AT&T’s ownership of DirecTV which makes a tie-up with DISH very difficult), it seems clear that Ergen is setting his sights squarely on a deal to sell DISH (or perhaps more likely lease its spectrum, given the difficulty of reaching agreement on a sale price) to Verizon. So now, as I pointed out in November, the key question is whether Sprint will take this opportunity to satisfy Verizon’s spectrum needs through a sale of 2.5GHz spectrum? Given everyone in the industry is fed up with Charlie, that certainly seems like a plausible next step. If I’m right and DISH is determined to win a significant AWS-3 spectrum position at the end of the auction, then it seems highly likely that one or both of AT&T and Verizon will leave the auction with a significant shortfall in AWS spectrum in major cities including New York, Los Angeles and potentially several other markets. Then it seems Ergen’s calculation is that he will have significant leverage to force AT&T and Verizon to deal with him and lease spectrum on his terms (including supporting interoperability for his AWS-4 spectrum holdings). However, one way for AT&T and Verizon to freeze Ergen out and avoid having to make a deal would be for them to instead purchase 2.5GHz spectrum from Sprint. 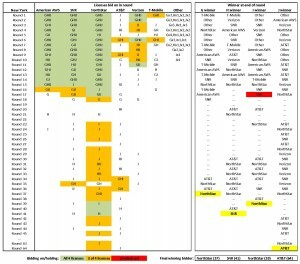 Its plausible that Sprint could raise as much as $10B relatively easily from selling say 30MHz to each of AT&T and Verizon, leaving Ergen holding an asset with no clear route to monetization and a buildout deadline which will start to become a pressing concern within a year or two (especially if DISH has not yet standardized the AWS-4 band). So does Masa Son want to boost DISH’s position at the expense of AT&T and Verizon, or would he like to get revenge for DISH’s actions in the Sprint & Clearwire bidding wars last year? If DISH is stuck with billions of dollars of spectrum it can’t lease, then DISH will be disadvantaged in mounting a competing T-Mobile bid, when Sprint renews its attempts after the 2016 Presidential election, because DISH will struggle to raise as much cash and DT will be reluctant to accept shares whose value is based primarily on spectrum assets with limited utility (remember that T-Mobile isn’t in a position to create an ecosystem for AWS-4, unlike AT&T and Verizon). In fact, Sprint could point to DISH’s reserves of spectrum as providing the basis of a new competitor in the wireless market, and could even gain the tacit endorsement of AT&T and Verizon for a purchase of T-Mobile. In addition, by selling some spectrum now, Sprint raises money to participate in the 600MHz incentive auction (where DISH may not have the resources to compete) and gets out from under the spectrum screen limitation. So it might well make sense for Masa to make a choice which boosts AT&T and Verizon, rather than cooperating with DISH. Incidentally, another side-effect of the AWS-3 auction prices is that Phil Falcone is now scrambling to get back into the LightSquared reorganization plan, as his argument that LightSquared’s spectrum should be valued at more than the debt gains support from these price benchmarks. For example, the unpaired uplink 10MHz B1 block (1700-1710MHz), currently valued at almost $1.3B, will be used to argue that LightSquared’s two 10MHz uplink blocks alone are worth double this sum. So the obvious counterstrike from Ergen is likely to be to try and blow up the reorganization plan and force LightSquared into liquidation. I understand conversion to Chapter 7 would invalidate the Inmarsat Cooperation Agreement, and thereby make it much harder for anyone to take on the risk of buying LightSquared’s assets. Of course, that is unlikely to worry Ergen (he would be expected to take a hard line with Inmarsat in any case), and would provide an opportunity to potentially buy LightSquared’s satellite assets for considerably less than the value of the LP debt and boost Ergen’s attempts to corner the spectrum market. As one person close to the case told me, such an outcome would literally make Judge Chapman cry. UPDATE (11/26): Another interesting question is the status of the 650M MHzPOPs of EBS spectrum (38MHz) that NextWave holdco controls in New York City. I would expect hectic bidding to secure access to that spectrum, if DISH turns out to be the winner of much of the AWS-3 spectrum in New York. Of course, Ergen has likely already thought of that, and I’d speculate that he might even have locked up an agreement to buy that spectrum block in advance of the AWS-3 auction, making it harder for Verizon and AT&T to address their potential spectrum shortfall in the New York market. That sounds a lot like AT&T intends to steal DISH’s concept of a fixed wireless broadband connection to rooftop antennas collocated on a satellite TV dish. Indeed, its hard to think of any other way for AT&T to advance an out-of-region TV+broadband strategy, in places where it isn’t the incumbent telco. Of course, the obvious rejoinder is “so why didn’t AT&T buy DISH instead and get hold of its spectrum”. However, its important to remember that AT&T has already turned down the opportunity to buy DISH twice in the last few years, in 2007/8 and 2012, both times apparently because it refused to pay Charlie Ergen’s asking price. And it seems the same is still true: my understanding is that Ergen has advertised his price to AT&T (and presumably Verizon as well) and indicated it was take it or leave it. Once again AT&T chose to leave it and this time moved on to negotiate with DirecTV instead (just like AT&T jumped to NextWave back in spring 2012). DISH’s price is pretty clear: in DISH’s Q1 conference call Ergen indicated that his spectrum should be valued at twice the amount that the AWS-3 spectrum is sold for in the upcoming auction, and that he expected the AWS-3 price to be higher than the $5B-$10B range cited by analysts. That implies a price of $20B+, in line with the value ascribed to spectrum in DISH’s current stock price, although perhaps not quite as high as the $26B cited by some reports. I’ve been skeptical of such high valuations, and think that the value of DISH to an acquirer should include value for both its spectrum and its 14M rooftops, which are potential sites for future small cell network deployments. I would go as far as to say the $20B of value could be attributed half to the spectrum and half to the sites, since 1M small cells generating $100/month in small cell hosting fees would certainly be worth $10B. If AT&T is thinking likewise, and expects future spectrum auction values to be rather lower than Ergen’s purported $1.33+/MHzPOP ($20B for 50MHz), then even if AT&T was prepared to pay $20B for DISH’s assets (excluding the satellite TV business itself) it would make more sense to buy DirecTV, which can provide the rooftop sites, and for AT&T to acquire the spectrum later. AT&T can look forward to a fairly clear run in the auctions, due to the amount of spectrum on offer over the next year, especially if Sprint and T-Mobile are consumed with trying to get regulatory approval for a merger during that period. Indeed AT&T has indicated that it plans to buy spectrum in the incentive auction next year and will bid at least $9B for 20MHz of spectrum. 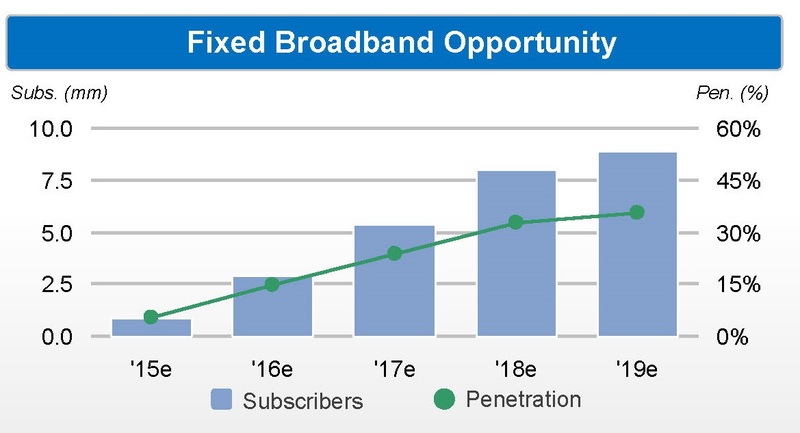 That is only $1.50/MHzPOP, little more than Ergen is valuing his spectrum at, for spectrum that should offer rather better deployment economics for rural wireless broadband. It hardly seems to be a coincidence that the DirecTV deal was secured just a few days after the FCC came out with revised incentive auction rules that were acceptable to AT&T. Ergen has justified placing a higher value on DISH’s spectrum because the AWS-4 band can all be converted to downlink, which should be much more valuable than uplink, as the majority of traffic is directed to the user. Even if that is true (and AT&T doesn’t seem to agree, because it appears to have foregone the option to convert the WCS A and B blocks to all downlink), it is partially offset by the lower efficiency (bps/Hz) of uplink traffic. More importantly, if DISH (or a buyer) actually deployed a fixed wireless broadband network using DISH’s spectrum, it would need to use uplink as well as downlink, so AWS-4 could not simply be all converted to downlink. Only if DISH’s spectrum were to be used in mobile networks, as supplementary downlink for the PCS and AWS bands, could it be used in an all-downlink configuration, and then AT&T or Verizon would have to buy the spectrum and put the effort into standardizing these new bands. So it would be entirely logical for AT&T to conclude that for fixed wireless broadband and small cell hosting, its simply not worth paying Ergen’s asking price. Instead, by buying DirecTV, AT&T gets the sites it needs thrown in for free with DirecTV’s satellite TV business, and the FCC has now created the right conditions for AT&T to buy the spectrum it needs in the upcoming auctions. This of course leaves DISH in a difficult position, because Verizon has indicated that it doesn’t believe that deploying wireless connections to rooftop satellite TV antennas makes sense (both DirecTV and Verizon were skeptical after their previous joint trial), so it wouldn’t attribute much value to DISH’s rooftop sites. In any case, after buying Vodafone’s stake in Verizon Wireless, Verizon’s balance sheet would be unlikely to accommodate a near-term purchase of DISH. So perhaps Ergen’s last option for a near-term deal is a partnership with Sprint, to facilitate a fixed wireless deployment and allow Masa Son to fulfill his promise of competing in fixed broadband if Sprint is allowed to purchase T-Mobile. Even for mobile users, Sprint certainly needs tens if not hundreds of thousands of new cellsites if it is going to deploy its 2.5GHz spectrum beyond urban cores, and DISH’s rooftops would be the best way to get that at reasonable cost. If not, and Sprint bids for T-Mobile anyway, then DISH will have to go all out to block that deal. Of course, the most likely way to resolve the difference in expectations about the size of the break fee (Sprint has offered $1B, but DT wants nearer $3B) would be to offer T-Mobile some of Sprint’s 2.5GHz spectrum instead of more cash. However, that would provide DISH with an even bigger incentive to block Sprint’s bid, as giving DISH the opportunity to acquire some 2.5GHz spectrum is precisely what Ergen wanted Softbank to concede when they battled over Clearwire last year. If DISH does succeed in blocking a Sprint bid for T-Mobile, and T-Mobile is left with 20-40MHz of 2.5GHz spectrum, then there would be every reason for DISH to look at buying T-Mobile next year, as the only remaining way to make use of DISH’s spectrum assets. Today the H-block auction finally came to a close, after taking longer than many expected to reach the reserve price of $1.564B. Its clear that DISH won virtually all of the licenses, since it was able to select a sequence of bids to exactly match the reserve price. However, DISH has also faced unexpectedly prolonged opposition from one other bidder who kept bidding on one or two small licenses (and switching around to find the relatively cheaper licenses) for several days in an attempt to secure a license that DISH might buy out later on. The competitor seems to have had only about 60,000 bidding units of eligibility yesterday and more than likely ended up winning one or two small licenses for a couple of million dollars total (a price of about $0.30 per MHzPOP). Stopping at the reserve price and being prepared to buy out the competitor later on (for say $10M-$20M) certainly made more sense for DISH than continuing to play Whac-a-Mole and bidding up licenses across the board to win all of the licenses at a much higher price. So now the question is whether we will see DISH announce some sort of deal to put its spectrum to use in the near future. Ergen has ruled out bidding against Sprint for T-Mobile, but that doesn’t mean DISH wouldn’t oppose such a bid at the FCC and DoJ. Indeed, if Sprint decided to pay T-Mobile a break fee mainly in spectrum, which would almost certainly be in the 2.5GHz Clearwire band, DISH would have a big incentive to try and block Sprint’s bid before later engineering a lower priced deal with T-Mobile. On the other hand, DISH’s H-block win now gives Sprint more incentive to include DISH in any deal with T-Mobile (most likely joining with DISH to roll out a competitive fixed broadband wireless solution using DISH’s satellite TV antennas while perhaps leasing the H-block from DISH). However, if DISH is left out in the cold by Sprint, Ergen could eventually turn his attention to a merger with DirecTV. Some thought that the asset swap between DISH and EchoStar that was announced last week was intended to “pave the way for a merger with DirecTV”. However, I think that misunderstands what the next move is going to be and that this deal was intended to set EchoStar not DISH up for a near term transaction, by giving it more satellites plus a guaranteed (and incentivized) satellite broadband customer for the next 10 years, while removing some of the risk associated with consumer retail sales (which is less attractive to an FSS operator). That deal is highly likely to be with Telesat and/or Loral, which recently was reported to be up for sale and has been looked at by Ergen in the past. In contrast, any deal with DirecTV is more likely to be months away. In addition to all of this action for DISH and Echostar, Ergen was also basically told by the judge in the LightSquared bankruptcy case on that he (i.e. SPSO) needs to come up with an alternative plan for LightSquared before the confirmation hearing on March 17, because she is “not going to say today ‘lights out on this company’” by rejecting the current plan from the company, even though SPSO has “strong” arguments that the plan is infeasible. So now we appear poised to see one or more transactions from DISH, EchoStar and/or SPSO in the next few weeks. I would estimate that the probability of a LightSquared offer from SPSO is at least 90%, and the likelihood of a Telesat/Loral deal with EchoStar is perhaps 60%-70%, but the chance of a (much more significant) Sprint deal with DISH is no more than 30%. Nevertheless, that will still be plenty to keep Charlie busy for the time being. After all the back and forth in court this week, with testimony from Charlie Ergen and Phil Falcone about Ergen’s purchases of LightSquared debt, the casual reader could be forgiven for thinking that this is still a battle between the two of them for control of LightSquared. However, a court filing from LBAC today emphasized that DISH is withdrawing its bid and if their argument (that DISH’s bid is not locked-up) stands, it appears that the Ad Hoc Committee will have an uphill task in moving to confirm a plan based on sale of the assets. Instead, if LightSquared can get sufficient commitments tomorrow so that the $2.5B of new debt needed to back its reorganization plan is in place (contingent of course on FCC approval), then both Ergen and DISH appear happy to step back and wait to see what happens. If the FCC did give LightSquared the approvals it wants, which Falcone has “a pretty good feeling about” (mirroring his confidence back in 2011 that GPS interference issues could easily be solved), then Ergen would get repaid with interest (assuming he wins the current trial), and if the FCC refused (or declined to rule), then he could come back with another (lower) bid later on. What’s far more intriguing is why DISH now seems to regard LightSquared as dispensable, at least for the time being. Remember that Ergen testified DISH only became interested in LightSquared as a backup plan once it became clear DISH would not succeed in buying Sprint or Clearwire. In addition, rebanding the AWS-4 uplinks to downlinks and pairing with LightSquared’s uplinks would delay any network deployment by at least a couple of years. So it seems highly likely that Ergen has another plan in mind, which DISH will move to implement soon after the H-block auction is complete. There are repeated rumors about a Sprint bid for T-Mobile and an expectation that DISH would mount a counterbid. But it still seems that Sprint would have a tough job getting regulatory approval. BTIG seem to think that a asset sale by Sprint to DISH would be one solution (what assets this would be is unclear, but we suspect DISH’s main objective would be to get hold of Clearwire spectrum, not a retail wireless business, and Sprint doesn’t need to buy T-Mobile for its spectrum). But isn’t a direct Sprint/DISH partnership a simpler solution, with a Sprint bid for T-Mobile acting as a backstop option if a deal with DISH falls through? Its surprising how few people really seem to have grasped what DISH’s key asset is, namely that its 14M potential towers (i.e. rooftop satellite dishes) are at least as valuable as its spectrum (and perhaps more so, since using the AWS-4 spectrum for a fixed wireless broadband network wouldn’t be a very high value use). 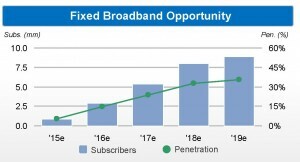 Consider for example, a wireless broadband network deployed to 20% of DISH’s current customer base (2.8M households), let along the 8.5M targeted in DISH’s April 2013 Sprint bid proposal. If DISH can rent even a fraction of this tower space for $100 per month (compared to the $1700 or so that is charged by traditional tower companies) to Sprint to host its 2.5GHz small cell buildout, then that could generate at least $1B per year of incremental cashflow, with little or no offsetting costs (remember the power and space is provided by the homeowner). Moreover, DISH’s best use of its money would then be to try and buy DirecTV, offering a national broadband fixed wireless competitor and ensuring that AT&T couldn’t gain a similar buildout opportunity via DirecTV’s satellite dishes. We’ll see what happens in the H-block auction next week, but even that may not be particularly critical to DISH’s near term plans, and I’d expect DISH could be quite content to be outbid on many licenses by non-strategic investors. Then regardless of what happens to LightSquared in the next few weeks (and things may go at least somewhat quiet for much of this year while the company makes yet another effort to secure FCC approval), my bet is that we’ll be hearing a lot more about Ergen’s wireless plans in the next few months. The announcement today that DISH is pulling its bid for LightSquared has thrown what was already a massively complicated and controversial bankruptcy case further into chaos, as we start the trial on whether Ergen’s purchase of LightSquared debt was illegitimate (and warm-up for a lengthy contested confirmation hearing over the next 3 weeks). Of course, the withdrawal of the bid completely undercuts LightSquared and Harbinger’s arguments that Ergen always knew DISH would come in and buy out his debt holdings and it will be interesting to see the effect on this part of the trial. Thus the withdrawal is certainly a logical move simply for that reason alone. However, as we move forward into confirmation, there are two further possibilities to be considered. If DISH’s move is simply a strategic maneuver to undercut LightSquared’s lawsuit against Ergen, then it would be logical to expect DISH would ultimately give in when the debtholders attempt to force specific performance of the Asset Purchase Agreement (assuming the Ad Hoc debtholder reorganization plan is approved by the judge). A second more intriguing alternative is that DISH and Sprint might be nearing a partnership deal, under which Sprint could use DISH’s satellite TV antennas (backhauled via a fixed wireless network using AWS-4 spectrum) for a 2.5GHz small cell hosting strategy in suburban and rural areas and DISH would resell Sprint wireless services. After all, if there is a near term deal to move forward with a wireless partner and an AWS-4 buildout, then the rebanding and delay associated with a DISH acquisition of LightSquared would probably cause more problems than it solves. Certainly a hiatus in negotiations between DISH and Sprint seemed to be behind the leaks before Christmas that Sprint was planning a bid for T-Mobile and DISH’s rejoinder that it would consider a rival bid. Indeed one could view AT&T’s recent offer of a $450 incentive to T-Mobile customers as an attempt to kill any prospects of regulatory approval for a Sprint/T-Mobile tie-up. So from that point of view, Sprint’s only viable big move in the near term is a deal with DISH, and I’m told large scale deployment of such a network could double the total wireless network capacity available in the world today. Another factor worth considering is that DISH’s move creates further uncertainty for the H-block auction as well, because (especially after Echostar’s purchase of Solaris, which has overlapping 2GHz band spectrum in Europe at 1995-2010MHz uplink and 2185-2200MHz downlink) the possibility that DISH will not decide to switch its AWS-4 uplinks to downlinks is back on the table. Nevertheless, even if DISH doesn’t buy LightSquared, and no deal is ultimately worked out with Sprint, DISH could still come back and buy the 1695-1710MHz unpaired uplink spectrum in the FCC auction later this summer, likely at a lower price (and with rather less risk) than it would be taking with LightSquared – as unpaired uplink this band will probably sell for around $0.30 to $0.40/MHzPOP unless AT&T and DISH both bid aggressively against one another. So DISH certainly still has many spectrum options left on the table this year. Today and tomorrow the LightSquared hearing will involve live testimony from both Ergen and Falcone about the debt purchases. Given that DISH’s maneuver has now undercut many of Harbinger’s arguments, and Ergen still seems to have plenty of cards up his sleeve, it will be interesting to see just how far Phil is out of depth in this great game.